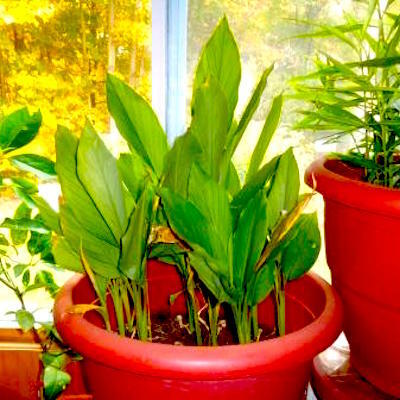 It is easy to grow turmeric plant indoors or outdoors if you live in a warm climate. It is low-maintenance, loves partial sunlight, and you can harvest sections at a time, leaving the rest of the rhizomes in the soil to continue growing. Turmeric is such a useful medicinal plant that you can use in many recipes! 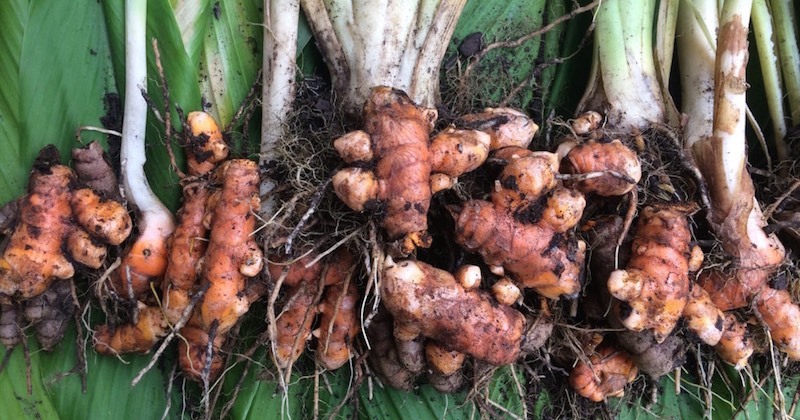 What’s not to love about growing turmeric at home? This beautiful plant adds an exotic flair to any room. Depending on where you live, you can also grow turmeric outdoors in warmer weather. Turmeric is a perennial plant and so easy to grow. The rhizomes will grow like weeds and you will soon have an endless supply of fresh turmeric, enough even to sell or give away! Unlike most herbs, which are usually harvested for their leaves, you grow turmeric for its roots. The plant grows an underground tuber, or rhizome, much like ginger root. It does not produce seeds, so planting the rhizome is the way to go. Turmeric takes about 6 to 8 months from planting to harvest. A fully-grown turmeric plant has large green leaves and may grow up to three or more feet tall. As the plant matures, each stem will send up a spike of greenish-white (or pinkish) flowers. Like ginger, turmeric is a tropical plant that thrives in warm, humid conditions, with well-drained, neutral soil. Turmeric grows best in temperatures from 65oF and 85oF (about 20oC to 30oC), so in cold countries growing the plant in a pot, indoors, is ideal. 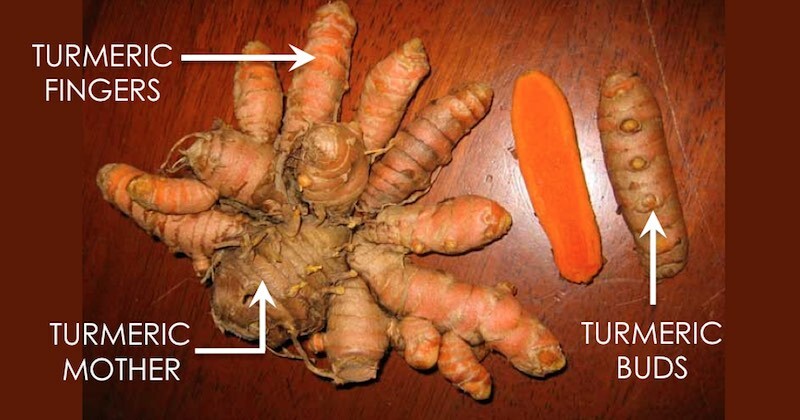 The best way to get your fresh turmeric rhizome is from your local organic health food store or farmer’s market. If you don’t find it at either places, the next best place is to get them from your local ethnic grocery stores (Indian or Asian stores). Select plump rhizomes with as many bumps (buds) along the sides as possible. Don’t use rhizomes that are shriveled and old. Unlike ginger, turmeric root can grow in every direction from its mother, so you will need a pot that is deep as well as wide. In a pot of about 12 inches wide and 12 inches deep, put one piece of turmeric finger that has a few buds. You want each plant to grow and spread its tubers freely. You may start sprouting your rhizomes in smaller containers and then transplant them into larger containers once they grow a little taller and develop sprouting leaves. Remember, they can grow to as tall as 3 feet or more. Grow turmeric in a light, loamy soil that is rich in organic matters. Use well-draining potting soil. Fertilize your pot every month with an all-purpose liquid fertilizer. Compost also helps. In cooler climates, you could add mulch on top of the beds to preserve soil moisture. 4. How much sun does a turmeric plant need? During germination of the turmeric rhizome, very little sun is needed. Morning sun exposure, or afternoon partial shade (probably placed by the window indoors) is all that is required. However, it is important to keep the soil moist, not wet, to prevent rotting. Once it has broken soil and sprouted in about a month’s time, keep the plant in partial sunlight. Turmeric can be quite a hardy plant that is seldom bothered by pests and diseases. However, in tropical countries and during the wet season, pests may be more active. Fungus may also develop, leaving blotches and spots on the leaves that will eventually turn yellow and fall off. Monitor your turmeric plants regularly so that you can catch any plant disease early enough. They can often be treated with a spray of hydrogen peroxide, baking soda, or insecticidal soap. Break the finger rhizomes off its mother, each piece with at least two or three buds. Fill your pot with the rich soil. Bury your pieces of rhizomes about two inches below the soil surface, with the buds facing up. Place the pot in a spot that stays reasonably warm and doesn’t get too much direct sunlight. Keep the soil moist, especially if the air in your room tends to be dry, using a spray bottle to mist it, or water it lightly. Turmeric is a slow grower. It will take about 4 weeks before you see a shoot breaking the soil. Be patient and you will be thrilled when you finally see the shoot! It may take about 8 to 10 months before harvest time. When the plant starts to turn yellow and the leaves begin to dry out, you will know that it is ready to dig up your turmeric. You can remove the dried leaves from time to time. There is no need to dig up the entire plant. Carefully dig up the plant and cut the rhizomes away from the stems. It is possible to harvest just a few root fingers as you need, and leave the rest of the plant to continue growing. Rinse off the dirt and your turmeric is ready to use. You can even take a few pieces from the harvested root to start another pot! Once you harvest your turmeric and wish to store them, do not wash. Just brush off the dirt and keep them in a basket, in a cool dark place. The rhizomes should stay fresh for up to six months. They are great to be used in cooking or in your juices/smoothies. What Does Turmeric Do For Your Body? Turmeric paste to supercharge your day. Turmeric lemonade that makes you feel good the whole day. Turmeric, tomato and black pepper soup to fight cancer and inflammation. 5 ways to make turmeric drink to reduce bodily pain and inflammation. Turmeric, ginger and coconut milk to help your digestion and sleep better. How to make turmeric supplement balls for instant anti-inflammatory relief. Important: DO NOT consume turmeric if you’re on these medication. 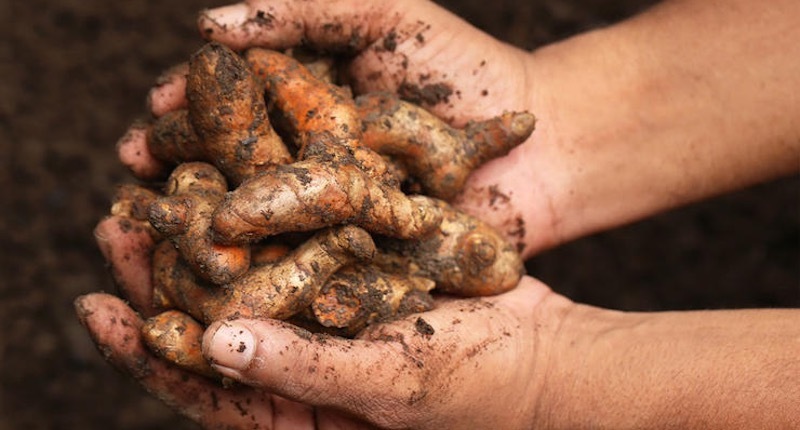 Exciting info … I always wanted to grow turmeric commercially so this is a good way to start learning and practising growing on a small scale, then move to large scale .. your post is so informative. Thanks.